As far as I can tell they think salty liquid water was under the dunes possibly "In the recent past". The thing is the location is towards the equator, and it is apparently supposed that ground ice was melted to cause the event. It is also supposed that it might be possible that the impact or whatever triggered it might have started a hydrothermal event. This is related, but suggests a situation where snow melt caused liquid water as recently as 200,000 years ago. 1) Their will be much effort to keep humans from landing on Mars before life is better searched for. 2) If humans go to Mars, the possibility of sufficient water on the equator should not be dismissed but investigated further. 3) In the process of terraforming Mars, indeed, the first goal is to cause it to snow again. That will support minimal temporary streams, which will possibly be of a sufficient magnitude to create "Dry Valley Lakes", which would be the first biosphere of signifficance for transplanted Earth life. What is the time scale for being called Recent? This mosaic of images from Curiosity’s Mast Camera (Mastcam) shows geological members of the Yellowknife Bay formation and the sites where Curiosity drilled into the lowest-lying member, called Sheepbed, at targets “John Klein” and “Cumberland”. The scene has the Sheepbed mudstone in the foreground and rises up through Gillespie Lake member to the Point Lake outcrop. Carbon dioxide dissolved in water combines with positively charged magnesium and ferrous iron ions to form carbonate minerals. Other minerals in the same rocks indicate that those ions were available. The other minerals found in the rock, such as magnetite and clay minerals, provide evidence that the ensuing conditions never became so acidic that the carbonates would have dissolved away. So other than the ice being covered with dust there does not seem to be any means to keep the water in a liquid form after sometime 3.5 billion years ago. As recently as 200,000 years, maybe in one case hundreds of years. The possible hundreds of years claim involves salty ground water under sand dunes. Potentially initiated to melt by an impact, near the equator. Possibly sustained by geological processes such as serpentization, where rock is "Rusted", by water. In this case the important questions are is there icy water or salty water under the equator in places. Such being released by an impactor, and possibly a chemical heating event initiated by an impactor. The scientists suspect that the dunes may have formed on Mars quite recently, potentially within a few hundred years. Per your saying liquid water cannot exist since 3.5 billion years ago, no not true. Liquid salty water at a cold temperature possible. Do I believe that it was in the last few hundred years? How would I really know? But the important point was that there apparently was ground ice to melt on the equator by an impactor/geothermal process. The other issue was "Snow melt water as recently as 200,000 years ago". This most likely would have been fresh water. Crater statistics allowed Andreas Johnsson and his co-authors to determine that the age of the crater to be approximately 200,000 years. This means that the crater was formed long after the most recent proposed ice age on Mars, which ended around 400,000 years ago. It is more likely that the water has come from melting snow packs, when the conditions were favorable for snow formation. This is possible, since the orbital axis of Mars was more tilted in the past than it is today," says Andreas Johnsson. So, for this one they speculate on a different tilt of axis, as the cause of the ability for it to snow, and for the snow pack to make muddy flows. If all the CO2 in the Martian ice caps were vaporized, then snow is possible on Mars. If it were all vaporized, and average pressure of 11 mb might be present, if so, then under a snow pack with sunshine, melting to mud might be possible. I would also speculate on volcanic eruptions and possible comet impacts, and perhaps even Methane emissions. My opinion is that the Martian climate fluctuates to be better than it is now and worse than it is now. Therefore in "Recent" times occasional circumstances where liquid water could exist. This is important for the possibility of terraforming to the point of snow pack, and temporary streams. That in turn might lead to ice covered lakes. I have to tell you I am rather disappointed by the reply you gave to me. You can speculate but its facts that rule....We have not gone to what is indicated as under cover of dirt and dust ice flows, we have not drilled into any salty water ice and seeing what we have for percolates its not likely to have any fresh water anywhere. I agree that the martian atmospheric pressure could have been higher and quite possible with solar to cause some of what we believe to be water flowing gulies, trenches, delta's ect... but we can not seem to find the smoking gun. We only have hints as to what has happened to mars with lots of speculations. For any mars colony to suceed water is a must regardless of form but it does come at an energy cost as well as deliverable mass at this stage of the game. The less the amounts of water the higher the energy level that will be required to create it. 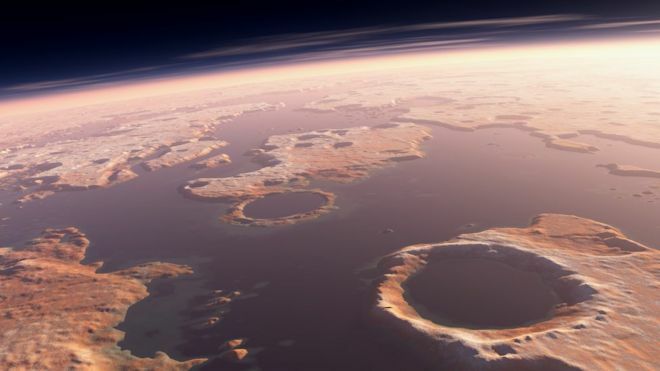 We know where there is at least one huge deposit of hydrogen containing material on Mars. That would almost certainly be ice. What we must have next is a mission to sample it and find out what we need to do to extract and purify it so that it can be used to support manned exploration efforts. I saw a proposal for a Red Dragon mission which would have drilling equipment in it. It was to have a sample return vehicle but I don't see this as necessary, remote analysis by on board equipment would be sufficient. Drilling can be a tricky thing. Bits break, pipe stem joints jam, equipment wears quickly, and exactly how much and what kind of drilling mud you use depends upon what's coming back up the hole. 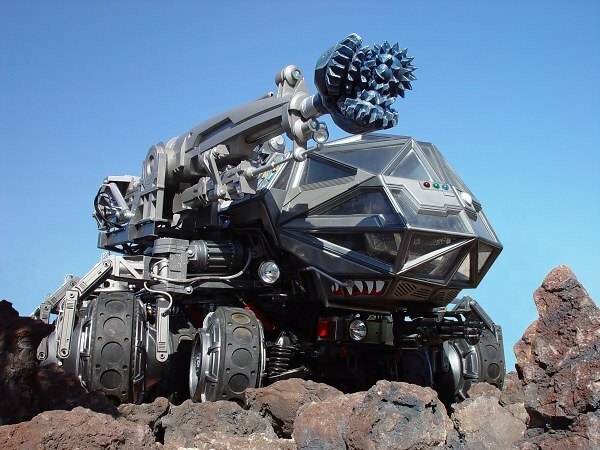 This is just not the sort of equipment that the crowd can do, which put aluminum tires on Curiosity for driving in the sharp rock country. I would be surprised if a robotic rig of any kind can drill successfully more than a meter or so. We'll need 10's to 100's of meters, at least. If it is more than half a dozen metres below the surface, I suppose a drill could reach it only with an extendible drill string, but looking at the scalloped terrain pictures, I think it may not be that deep. If it is deeper you will indeed need a multisection, rotary drill and would require a human presence, but that is putting the cart before the horse. We need to prove the resource before we put people there who may depend on it. Perhaps the idea of bombarding it from orbit might work. I posted about that some time back. The supposed water deposit is so extensive it would be difficult to miss it. What if it is actually methane hydrate and not just H2O? If it's methane hydrate, wouldn't that be much more interesting, given that the methane would most likely come from lifeforms? With the some what seasonal methane releases that have been observed then this is also a probable for subliming from under the dirt and dust covered glacier areas. Water may soon become a luxury item for millions of American families. Although it’s a resource that most consumers take for granted, water is already unaffordable for one of 10 U.S. households, a share that’s forecast to triple to more than 30 percent of within five years, according to recent research from Michigan State University. Since there are no federal regulations either guaranteeing a citizen’s right to water or water affordability, some people may be faced with tough choices about how to pay their utilities as prices continue to climb. “For lower-income households, it could mean having your water turned off,” While various measures exist for water affordability, Mack relied on a threshold set by the U.S. Environmental Protection Agency under which people shouldn’t pay more than 4.5 percent of household income on water and wastewater bills. I live in Texas. We routinely alternate between drought and flood. The climate average here is nonsense: it is never average, it is always one extreme or the other. You get used to it. We used to laugh about Californians coming here and getting scared by our tornadoes, and going home because they preferred the earthquakes we never had. Now we are starting to have those as well, in those places where deep-well disposal of used frack fluids gets a little too enthusiastic. I myself have seen dust devils with wind speeds equivalent to an F1 tornado. A sheet of 1-inch plywood that is 8 ft by 12 feet looks awfully small at 2000 feet up, flying in one of those giant dust devils. Saw that on the construction site where DFW airport is today. All that dark clay dirt exposed to summer sun generated the heat to power such huge dust devils (it was 115 F in the shade on site when I saw it, versus 102-104 F in Dallas and Ft. Worth that day). The team believe an asteroid triggered 150m-high waves when it plunged into an ocean thought to have existed on northern Mars three billion years ago. This terrain has previously been interpreted as having been caused by mud flows, mud volcanoes, or glaciers. With enough soil on top of the water and enough salt, we may expect to find liquid water, as brine, at depth, below a layer of ice. I wouldn't like to guess at what depth. Also, with a thick layer of soil to insulate it, ice may be preserved under volcanic deposits, whence it might escape later as massive floods. Those dark streaks may be the result of granular flows like sand and dust, according to a study published Monday in the journal Nature Geoscience. The problem I have with a lot of this coverage is that multiple satellite surveys have shown there to be water present in some form across the planet. I think it is reasonable to suppose the water is present as permafrost of ice particles bound up the dust. 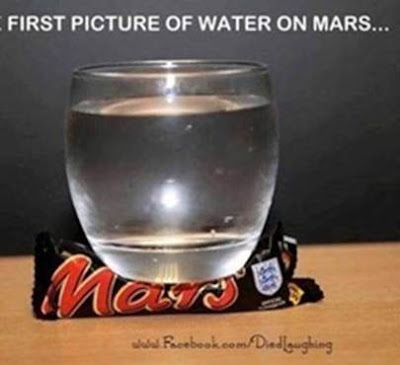 I am not convinced NASA tells us everything about their discoveries on the surface. If there isn't water easily available where are the survey signals coming from? If the dust is bound together with ice and that ice sublimes due to seasonal solar warming the dust will then be free to flow down slope. These lineae are then still down to water held in the regolith. Same applies if the water is liquid with antifreeze salts and it evaporates, although you would then get salt deposits which might inhibit sand movement, or enable it, depending on how it is precipitated. On the satellite surveys: what they show is the presence of Hydrogen. The assumption is made that this is due to water. It might be due to hydrocarbons, ammonia or anything else that comes with Hydrogen . I don't think either of these is necessarily likely, but there is a chance that some could be in the form of methane clathrate. Yes, that's rather battlestar isn't it. I don't consider "Mining ice to be very sensible either". Going for the low hanging fruit, is the right thing I think. Microwaves and a vacuum cleaner at first, with a tanker truck as a condenser that you compress the vacuumed steam into. Several regions on Mars are potentially water-rich (dark blue), including broad areas near the equator. But the ice patches also present a puzzle. According to current models of Mars’s climate, equatorial ice can’t persist for more than 125,000 years or so, Wilson says. That’s because it would gradually sublimate into the atmosphere, even if buried beneath a shallow layer of insulating soil. If ice truly exists there, it could be evidence of a shift in Mars’s rotational axis within that time window, Wilson explains. Small blue areas can be seen in several spots near the equator, and that is supposed to indicate water. The assumption is ice, but I also entertain, brine, or frozen brine as lesser probabilities. Well, I had an older article about microwaving water, but it looks like SpaceX is into it now, and has a place in mind "Arcadia". And it is near Olympus Mons, which means volcanism, and probably lava tubes. That would also mean that if they wanted to try mountain hopping onto Olympus Mons later on they could. That would be to do a hop up on top of it and then refuel there if that is possible. Then head to orbit. Interesting. Knowing that even the soil has some water in it, it would seem a good plan. Meanwhile, Bruckner has taken the concept in a different direction. Instead of trying to draw trickles of water out of Mars’ air, he’s looking into using microwaves to cook water out of Mars’ soil. “It’s a natural WAVAR,” Bruckner said. The process could be workable for places like Utopia Planitia, where researchers say a lake’s worth of water lies frozen in the soil across an area wider than the state of New Mexico. I bet it is underfunded, and not built to a practical scale yet. So, lets have a look at the company Qmast, and there efforts to microwave oil out of "Oil Shale". Oil Shale is not the same as "Shale Oil". Shale oil you frack. For Oil Shale, the plan is to drill and then microwave the hydrocarbons and some water out of it. 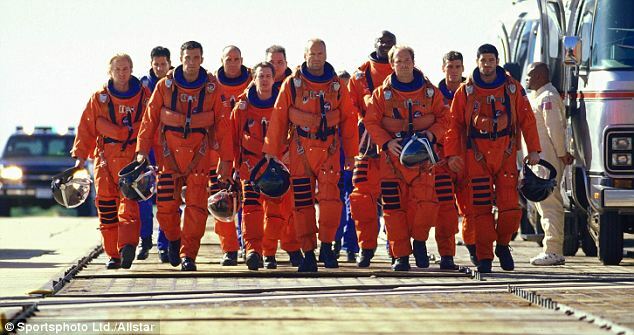 However for Mars, I think not doing the drilling is fine. Just keep your people out of range of the microwaves and shoot downward. This is a very long article to post, but it is quite interesting, at least to me. Eighty feet is not a lot, were it not for the estimate that one single microwave-stimulated well can yield up to 800,000 barrels of crude. For now, this sounds too good to be true, and Qmast has not yet started doing trials outside the lab. It does have plans to launch trials outside the lab next year, and even has the ambition to start producing crude by the end of the year. So, by keeping an eye on their technology, it seems reasonable that it could be borrowed from. Sorry if you are not through but I thik this will make you smile List of methods, Mining with microwaves, Shaken, not stirred, Drink your (Mars) milkshake? A thin layer of water frost is visible on the ground around NASA's Phoenix Mars Lander in this image taken by the Surface Stereo Imager at 6 a.m. on August 14, 2008. The frost began to disappear shortly after as the sun rose on the Phoenix landing site. The microwave accelerated reaction system is designed for digesting, dissolving, hydrolyzing a wide variety of materials in a laboratory setting. I can see even a solar powered rover roaming to a destination, charging its batteries sort of getting ready for a timed drop of a cone with the microwave within it with the vacuum ready for first light todrop the cone closer to the surface before heating the surface and sucking up the moisture as you put it into a tank like a wet dry vac...and then cooling to pump it to storage. There are actually two ways to condense the water steam. Cool it, and/or compress it. Compress it may avoid it turning to ice in the tanker, if that is a concern. But maybe that is not a concern. Now the SpaceX plans for 4 BFR's makes sense to me. I am sure the two first crewless landings will include methods to confirm probability of water. Radar from each into the ground at least. Perhaps more than that. And I suppose it will also confirm that the ground can support a BFR on it's landing legs. So then the two crewed ships, I would expect that one would land and people would get out and do more testing. Then the fourth landing I presume if all is well. Arcadia. That's a cool name for a new civilization on Mars. Kind of Sci-Fi ready. » Living inside Mountains / Caves on Mars? Another way to make a underground would be to extract ice from an ice slab at the ground line. These slabs are supposed to be hundreds of feet thick, but not pure ice. Some regolith mixed in. Some porosity (VOIDS) as well. This article talks about Utopia Planitia, and also mentions Arcadia Planitia as being very similar. So the idea would be to get down to the bedrock, and melt/evaporate water perhaps with an infrared heater. Collect the water, and perhaps make supports for the VOID created in the "ICE". Perhaps roman stone arch type structures could be used. I was worried that if you heated the interior, it would melt the ice above. That might be O.K. actually. For a time water might drip down to be collected. But the surface is quite sub-freezing, so I would expect the melting to have a limit upwards bound. When the dripping stopped, then a sealant could be applied to the rock structure down below. Of course if the ice above is being undermined by melting/evaporation, I suppose there could be collapses. That could be a problem if the arches were not strong enough to take it. Another method would be to simply melt a reservoir above the stone arches. Do it slowly so that regolith drops down on the arches in small amounts over a prolonged period. When there was enough regolith on top of the arches, then you could fully pressurize them as the air pressure would not then be enough to make them explode. So then you would have arch buildings on the bedrock, and a layer of regolith applying counter pressure against the force of air wanting to float up in water. You would then also have a body of water above that structure. If you added salts, then you could impose thermal stratification. That is the water above the regolith which would be above the arch buildings could be heated to room temperature and it would stay their even though the water on the surface might be quite cold. There are some potential flaws in the plan however, as the overlying ice with regolith and porosity, might be heavier than water. But the article indicates that it actually may not be. The porosity may make it lighter than water. Not all of the ice is the same. Some has more regolith some less. So, maybe in some locations this might work. If the "Reservoir" were melted all the way to the surface, then of course some engineered protective measure could inhibit sublimation of the ice surface. I suggest simple ~ambient Martian pressure "Greenhouses". Perhaps light could even get in through the greenhouses and ice into the "Reservoir". Utopia Planitia is about the size of New Mexico. That would be something.